Bootstrap templates are often regarded as one of a premier set of pages which are developed in manual mode and contain a set of free tools that are used for creating web applications and websites. The Bootstrap framework has been used by a number of businesses and is considered to be one of the most used CSS, HTML, and JS frameworks because of its simple and easy customization factor and featured process of client web development. When you compare Bootstrap to other complex programming processes, Bootstrap templates are the more convenient option. These templates are the ready-made form of website structures where you can choose the one that fit to your needs and requirements. If you feel that you have little or no coding skills, then you can choose Bootstrap website templates without looking back. All you need to do is to start building a design for your project is to choose and download the theme, apply modifications by using various built-in tools for customization and start running the website. What is the use of Bootstrap Templates? Bootstrap admin templates have a wide range of benefits. The main reason for choosing Bootstrap templates is that they are scalable to different screen sizes which turn to CSS media queries. A fully responsive PHP template can ensure that your website design will be compatible with any latest devices and desktops. Another reason for using Bootstrap themes is that they come with a built-in embedded functionality and custom add-ons which are designed to supplement each layout independently. If you are running any business or corporate website, then you definitely need to try premium bootstrap templates to achieve enhanced performance and additional functions for your web page. You can get premium templates which often provide child themes. And their main aim is to make sure that you find the perfect design that you need for your website no matter how picky you are! Bootstrap themes and templates are very easy to use and you do not require any special skill to navigate your way through this. These templates are robust and user friendly. The templates in Bootstrap are designed in such as way that they can be automatically adjusted and modified in their custom sizes and resolutions depending on the device you are using. This means that they can fit perfectly to any device like computer monitor or mobile screen. Bootstrap templates can be customized easily in a way you need it. You have the option to choose to keep it the way it is designed or you can add some custom features depending on your requirement. You can create the custom hyperlinks, modify the outlook of the theme, add images, and add more features with your creativity. If you are having a really tough time handling and you are almost running out of time to make your website, then you can just choose to use Bootstrap templates. These themes will provide you the foundation of your web page and you can develop the rest of the features in the little time you have. When you choose Bootstrap themes, then you don’t need to invest in web designers or programmers. You can find the templates on Coded Themes which are already made into complete website templates. These templates help you create your own website abruptly usable and you absolutely do not need to waste your time in developing the complete website. Templates are the best option if you are facing financial issues. Bootstrap can be used to make a new website or add a new web page to an existing website. You can catch up on a lot of technical details later on with the help of beginner programmers and experts. 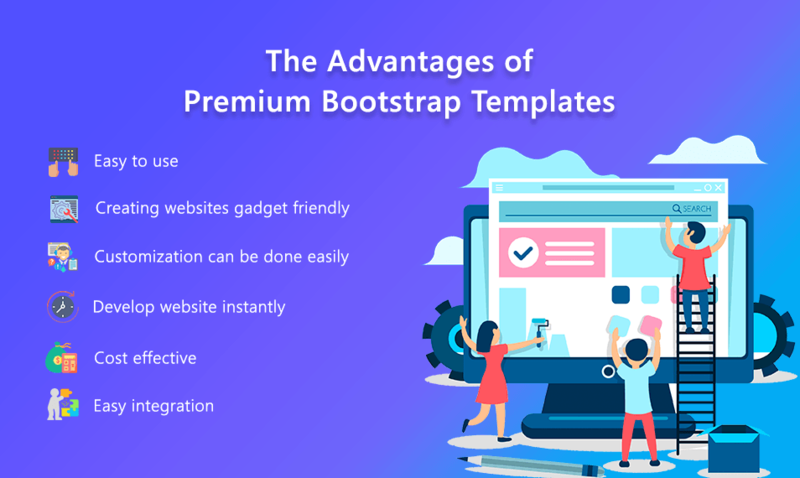 You can consider Premium Bootstrap templates when you want to create a website instantly or when you are very near to your deadline or if you don’t have enough money to create your own website. After all, Bootstrap templates are not bad and it sure does offer you with all the features to modify it. If you have any question, then please let us know in the comments section.